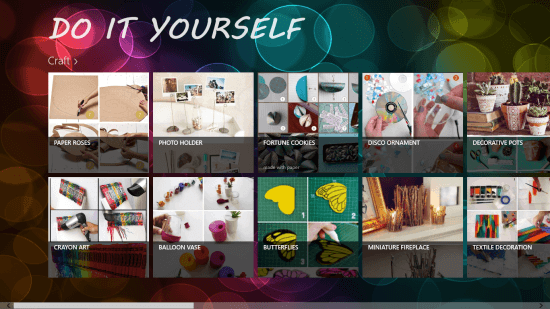 Do It Yourself (DIY) is a free Windows 8 creativity app that offers a number of DIY (Do It Yourself) ideas to help you make amazing things at home. It’s a versatile app that lets you discover unique creative activities or products under various types of categories like Craft, Nail Art, Food, Hair Style, Accessorize and Decorate. Under each category, you will find some activities that help you make unique things using minimum resources. The activties are shown in beautiful step-wise pictorial representations to make it easy to understand and follow. The app targets both kids and adults, means, there are dozens of ideas for the kids to explore on one side, and equally interesting tasks for the adult to do. If you are an enthusiastic creative person, Do It Yourself is a wonderful creativity app for you to explore. The app is freely available in the Lifestyle section of Windows Store. You can also get this app using the link given at the end. Let’s have a detailed look at how this free Windows 8 creativity app works. To explore the ideas that the app offers, you first need to install this app on you Windows 8 system. After installing when you launch the app, you will see the Start screen with the first category of Craft. The products under this category will be displayed as tiles, with name of the product at the bottom of each tile. You can use left and right headed arrows on your keyboard to move back and forth between the various categories. Craft category displays DIY products like Paper Rose, Photo Frame, Disco Ornament, Balloon Vase, Decorative Pots, and more. Nail Art category displays various designs to paint your nails. Food category has interesting veg and non-veg recipes like Pizza Margherita, Jalebi, Ultimate Chocolate cake, and Mexican Chicken Stew. Hair Styles category displays beautiful hair styles to groom yourself. Accessorize category teaches to make beautiful accessories like Rainbow Headbands, Safety Pin Bracelets, and many more. Decorate category gives you tutorials on easy to make Cell-phone Holders, Orange Candles, Sparkle Globe, etc. As you click on any tile in a selected category, you will see a step-wise pictorial representation of how you can make that product on the left side of the screen. On the right side of the screen, the material required will be mentioned. For some activities, the method (textual instructions) of making a specified product is also mentioned. Especially in Food category, the steps of making a particular dish are also mentioned along with the ingredients. You can use the left and right headed arrows to navigate through all the products displayed in a category. The back arrow button on the top left of the screen will take you back to the main screen. 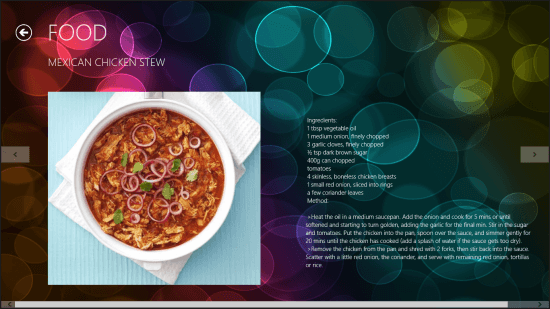 Free Windows 8 creativity app. Do it yourself activities/ products under various categories. Pictorial representation of steps of making. Similar app: Creative Ideas for Windows 8. Do It Yourself app is an awesome collection of activities and products that you can easily make yourself at home. 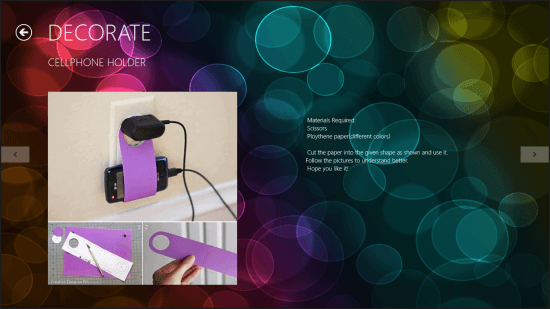 This free Windows 8 app is easy to use and display steps of making a product in the form of pictures. The best part is that you get different types of DIY activities at the same place and these are really easy to do. Definitely a must try app! Get Do It Yourself here! Also check out some free painting apps for Windows 8.